A prison officer is under investigation after an anonymous witness in the murder trial of three prisoners had his identity revealed in court. 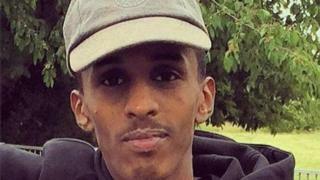 The inmate, known by pseudonym Bobby Dorset, was giving prosecution evidence over the killing Jamal Mahmoud at Pentonville prison, north London. The witness could be seen "through a crack in the door", Judge Richard Marks QC told the Old Bailey. Mr Mahmoud, 21, from Enfield, was attacked on 18 October 2016 in a row over contraband smuggled into the north London jail, the court had been told. Basana Kimbembi, 35, Robert Butler, 31, and Joshua Ratner, 27, were cleared by an Old Bailey jury. However, Kimbembi was found guilty of wounding another inmate, Mohammed Ali, with intent to commit grievous bodily harm. The full circumstances in which Mr Dorset was identified can only now be told after the court lifted a ban on reporting legal discussion in the absence of the jury. In order to keep his true identity secret, special measures were taken to enable him to give evidence. But after less than an hour in the witness box on Wednesday, 19 October, Judge Marks QC called a halt to his evidence and sent the jury home after being given a note by a prison officer. One of the prison officers, he said, had "opened the door to inform the court staff the defendants were up" and "by an unhappy coincidence, the witness was in the witness box because the sound equipment was being tested". As a result, he concluded, there was a "strong likelihood" Kimbembi was able to identify the witness. HM Prison Service, which is leading the investigation, declined to comment.